Time for another linkfest summarizing the latest in new regarding Transformers. 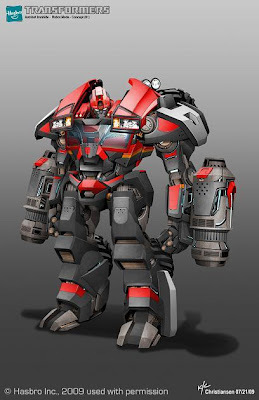 This edition has a look at the concept art for Ironhide, video and galleries of next wave of toys including Transformers: Generations, another Fall of Cybertron Bruticus box set, Cobra Commander crossed with Soundwave, four TF: Prime toy reviews, a stunt award of Transformers: Dark of the Moon, a real life transformers, and more. Hit the link for 10 videos that show off all the products that Hasbro had on display at Botcon a few weeks ago. Most are scheduled for release this year with Generations coming out next Spring. Hit the link for official images of Hasbro's Generation toys based on the Fall of Cybertron figures. The deluxe toys are Fireflight, Kickback, Sideswipe, Starscream and Ultra Magnus. The Voyager link is for SoundBlaster with Buzzsaw and Soundwave with Laserbeak. The in package link is a look at Optimus, Jazz, and Shockwave. Starting to get excited about the Generations toys. Too bad they are not scheduled for release until next year. Speaking of Fall of Cybertron toys, it turns out that there may be at least three versions of the FoC Bruticus set by the end of the year. There will be the San Diego Comic-Con exclusive box set sporting their Generation One colors, the individual releases of the deluxe toys for retail in their standard "vibrant" colors and now an Amazon exclusive box set of those five. No price but the release date is expected around October. At least now know if miss out on the SDCC version, you still have two more chances to get the combiner. At the link is a bunch of images that show off the various Dinobots in action within the game. I think Grimlock is the only playable Dinobot but there are still a lot of details about the game that has not been released. Shout Factory has announced two new DVD releases for retail. 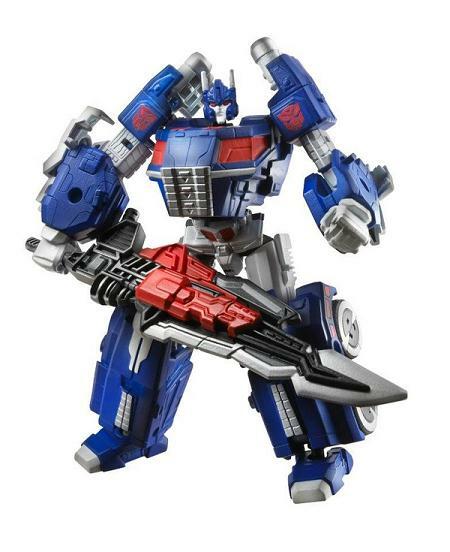 On August 28th, they are releasing Transformers Japanese Collection: Victory. This is the final set of the Japanese collection that included Super-God Masterforce and Headmasters. These sets has previously been released by Shout Factory as one set via their website. Think of them as seasons 5-7 of G1 Transformers that were never aired stateside. 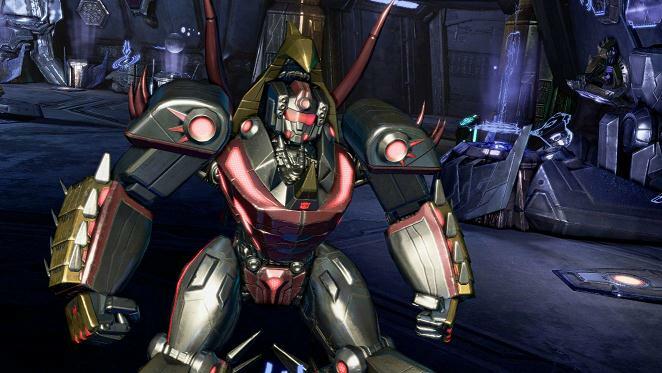 Also, Transformers: Prime - One Shall Stand is coming out on July 31st for $15.00. This is the last four episodes of the first season of Transformers: Prime. I recommend spending the extra $5 and getting the entire season of TF Prime. On a somewhat related note, the original Transformers seasons are now available on Netflix. 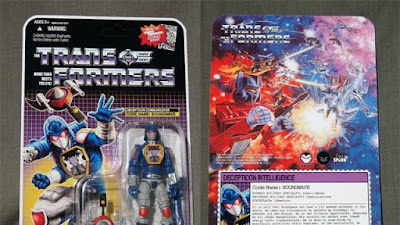 Airmax has created an interesting combo product that combines the features of GI Joe's Cobra Commander with Soundwave, complete with a little Laserbeak. Hit the link for the next wave of TF Prime releases that will hit shelves in the next few months. Wave four is Airachnid, Shadow Strike Bumblebee (repaint), and Dead End (Wheeljack repaint). Wave five is Rumble and Sergeant Kup (repaint of Deluxe Ironhide). As a kind of heads-up to any bloggers, it seems Hasbro is getting aggressive about stopping leaks. The Transformers Galaxy - Hong Kong Fans Group Facebook page shut down due to leaked toy images but the request was to remove the images and the club admins over-reacted with a shut down. In the case of a Nerf Gun leak, it seems Hasbro might have done the over-reacting. Using the promise of free swag, Hasbro was able to get the person's address which they then used to send a cease and desist and demand the source of his information. Weeks later it seems Hasbro reps (or their investigators) were spotted by neighbors lurking around his apartment waiting on him to try to get the source info. The backlash nearly led to a boycott in Australia. I am not sure the media protections in Australia but this is the third story I have read lately about Hasbro's tactics in other countries. From my experience with this blog, the most I received was a politely worded cease and desist email and never been even asked about providing sources. I suspect that this comes down to different tactics being used depending on the country the big wigs making the decisions are in but Hasbro corporate may want to consider coming up with a global policy to avoid these PR disasters. Hit the links for various reviews of TF Prime toys. Based on these reviews, it seems that sadly it remains recommended that you avoid the Voyager line and instead focus on the deluxe or the Commander line. If on a type budget, just stick with Commander class figures as most of them seem to be the right combination of good looking modes, with fun transformations. Earlier this month the winners for the Taurus Stunt Awards were announced. Transformers: Dark of the Moon was nominated in two of the eight categories. One was for Best Specialty Stunt (bird men sequence) and Best Stunt Coordinator or 2nd Unit Director. Below is the video of the segment where Transformers won the Best Specialty Stunt category. Thanks to Mauricio D. for the link. Here is a video of a remote controlled Transformer that goes from vehicle to robot with push of a bot. Not a real product but a pretty sweet fan creation built by Kenji Ishida and JS Robotics. Giant is the not Devastator combiner that 3rd party MakeToys is producing. The first set came out a few months ago and the next set is out now. I think the price is $120 for both. Overall not bad but you are paying a premium to get deluxe sixed figures. The green version of Giant is scheduled to come out in mid-Summer as one box set of all six figures for around $350. A gallery of this set can be found here. Below is an edit that presents only the transformations from the first Transformers movie.